It’s been a very busy week for the entire stretch of the membership of St Andrews Table Tennis Club – from Keir Paterson, a Primary 5 pupil, to Len Pratt who, in his 80’s, is the eldest of our past players. Alongside brother Murray, Keir was selected to represent Dundee & District in the Scottish Schools Finals in Bathgate on Sunday 21st. While both found it difficult to gather wins on the day, with the top Scottish juniors taking to the tables, the brothers gained great experience from their first outing at this level – and as the youngest player competing on the day, Keir has time on his side! At the other end of the age scale, Len donned not his table tennis kit but collar and tie to attend the club’s annual dinner in Ceres – an event with special significance as a celebration of the club’s 50th anniversary. Club chair Neil Lea welcomed a good turnout of players and partners from the breadth of the club’s activities and, after the meal, past Chair and current treasurer Bill Sutherland gave an entertaining speech with a nostalgic look back at table tennis in the post war era, and then paid tribute to the social strengths of the club – just as valued as the playing side. Unusually, all four our teams were involved in league play on Monday evening. At the Victory Memorial Hall, it was always going to be a tough Monday night for Prefects and New Kids as they faced opposition from the current leaders of their respective divisions. The latter could find no way to win even a game against Barons whereas Prefects did manage two wins against Division One table toppers, Star. 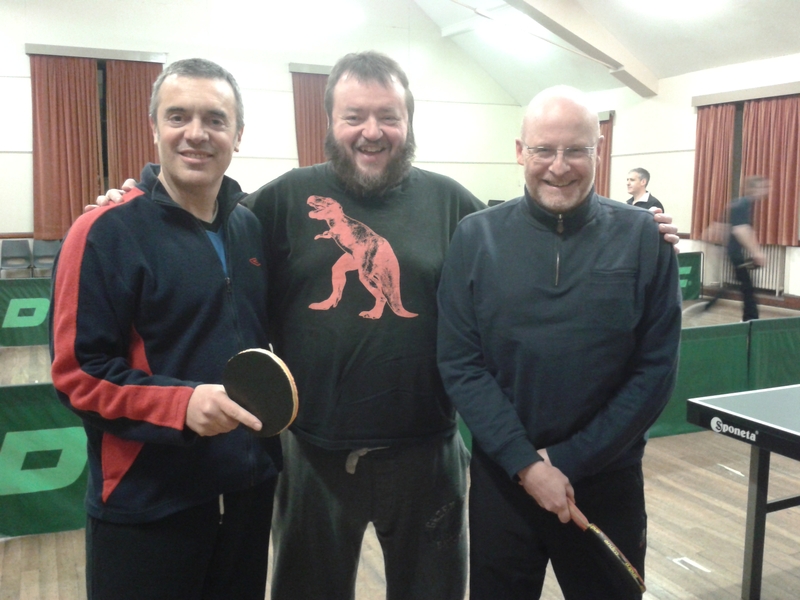 Both Peter Bladen and Robert Brown defeated Andy Ferguson – probably Robert’s best win to date. Over in Broughty Ferry, Prospects were again hampered by being a player short, but Emily Howat and Dave Goddard battled gamely against Sputniks. They were unlucky to lose an entertaining doubles 9-11 in the fifth and Dave managed a consolation win against Sandy Bertie. 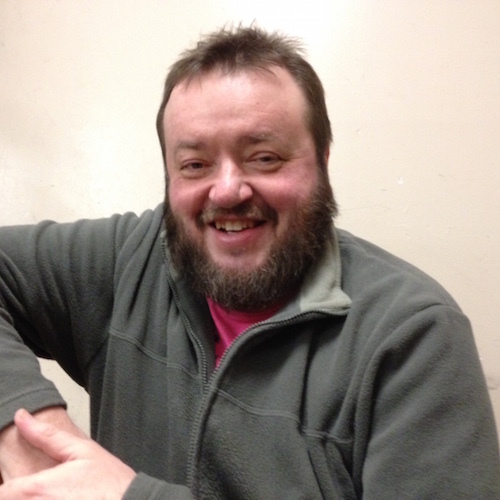 On the neighbouring table, Dave Beveridge felt justifiably aggrieved at losing out to an ‘edge’ when 9-10 down in the fifth against Dougal Ogilvie in Swots’ Division 2 encounter against Comets. Swots went 2-0 down when microbiologist Emma Bissett then lost to Jill Milne but Elaine Forbes turned the evening around by hanging on against some huge hitting from Fraser Smith. A final 7-3 scoreline in the St Andrews’ team’s favour cemented their mid table position. Finally, Fabio Sani and Dave Beveridge took part in the DDTTA tournament at Ward Road on Saturday 27th. With Division One players excluded from competing in all but the handicap event, both experienced a mixture of wins and losses in a busy day’s play. Dave ensured there will be at least one St Andrews’ name on a trophy this season when he paired up with Forthill’s David Sim to win the Hardy Doubles title, enjoying a 3-0 final victory against Craig Fraser and Fiona Kinloch. This entry was posted in Match reports, St Andrews Table Tennis Club on February 28, 2016 by standrewstt. With all four St Andrews teams in Dundee league action this week, main interest focused on the first visit to the Victory Memorial Hall of fellow Fifers, Lundin Sports Club. Arthur Duncan, Nat Forno and Ron Filsell have been the surprise team of the season. Entering the League for the first time, they currently sit at the top of Division 3. With Fabio Sani, Dave Goddard and Ian Brumwell available for Prospects, an interesting evening’s play was on the cards. Lundin were out of the blocks quickly, taking the first three match ups before Fabio won in four sets against Arthur – only the latter’s second loss of the season. After losing the first game, Fabio realised that Arthur was strong against both short balls and wide shots. Aiming long and to the centre of the table allowed Fabio to defuse Arthur’s main weapons. Despite many close sets, Prospects couldn’t build on Fabio’s success, with Ian feeling particularly unlucky to lose out 10-12 in the fifth to Nat. It was down to Fabio again to win Prospect’s only other point of the evening with a straight sets win against Ron. And so Lundin made the short drive home with another hard fought, but deserved, eight points in the bag for their promotion effort. In the other half of the hall, a Division 2 match between Swots and Thumpers produced some attractive play and Dave Beveridge literally gave blood for the cause when opening up the war wound on his playing hand for the umpteenth time. But apart from wins from Emma Bissett and Collin Bleak against Jim Fleming, there were no other winning whoops from the home side and so the second 2-8 defeat of the evening was posted. Prefects and New Kids visited Forthill Sports Club on Wednesday evening, both with hopes of repeating victories gained in the first half of the season against Rollercoasters and Tigers respectively. In the Division 1 fixture, Prefects dominated the early play with Peter Bladen, Robert Brown and Howard Lee each winning twice for an unassailable 6-0 lead. Robert and Peter added a doubles win and Peter another singles point before the end of play – hurray – an 8-2 scoreline in favour of a St Andrews team for the first time this week! More serious stuff on the other table, though, as Ian Smith, Kong Wan and Emma Bissett started out with great resolve to take something worthwhile from this Division 2 relegation battle. Kong and Ian put victories on the score sheet in the first round to lead 2-1 but then hit a mid-match slump with four losses in a row before Ian stopped the rot with the first victory of the night against Charlie Ross. With a 3-5 scoreline and hopes still of a draw for New Kids, Tigers pounced mercilessly on their prey for a valuable 7-3 win. New Kids are now in need of a superheroic effort to avoid the drop – but positive mental approach – there are still 60 points available to win in the remaining fixtures. This entry was posted in Match reports, St Andrews Table Tennis Club on February 21, 2016 by standrewstt. With the past week being less than memorable for the current St Andrews Table Tennis teams, it is preferable to contemplate some illustrious predecessors as the club celebrates its 50th anniversary. The Club has run a coaching programme for youngsters since the early 1990s and has a proud record of providing a number of players who have represented Scotland in the annual Home Countries Schools Internationals. First to bring this honour to the club were Grant and Garry Trewartha who in 1994 travelled with the senior age group to Ireland. They were quickly followed at the other end of the age scale by Johnny Randall whose fine showing at the Scottish Primaries Championship won him a place in the team which enjoyed great international success in Dumfries. 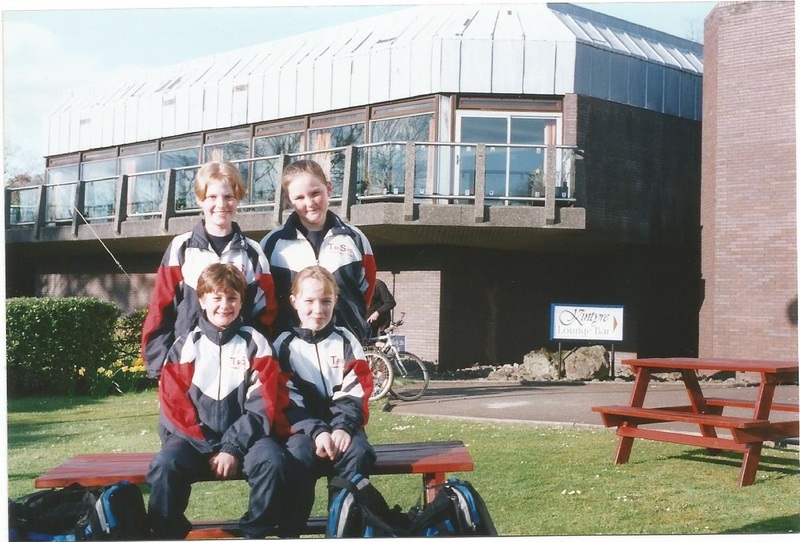 On the girls’ side, Alison Bell represented Scottish age group teams in the mid-90s, while Lindsay Forbes won international honours in the years either side of the millenium. Unfortunately from a table tennis viewpoint, all these star club performers were also gifted at other sports and, as the time came for them to make choices, they preferred to pick up cricket bats, wield tennis rackets, don football boots or, in Alison’s case, represent Scotland’s Ladies hockey side for over a decade in European, Worlds and Commonwealth Championships. They have, however, set the target high for others to follow and the club’s good wishes go with young Murray Paterson who has won through to represent the district in this weekend’s Scottish Schools finals. 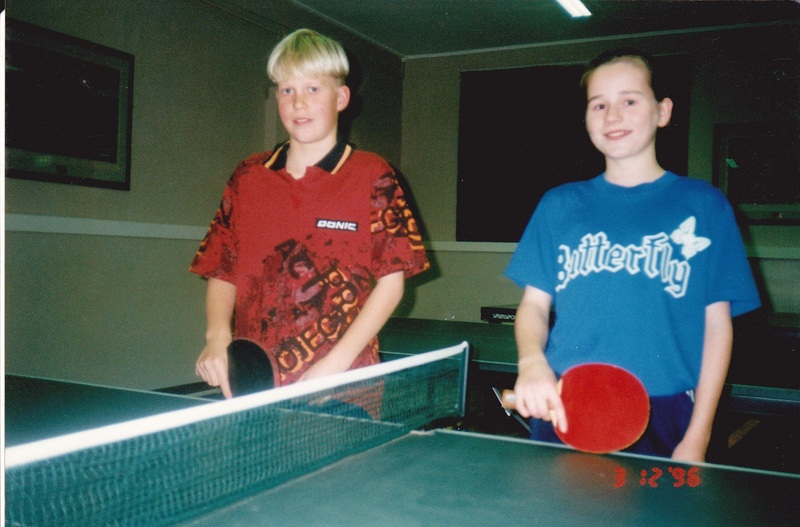 Maybe a good performance will persuade Mum and Dad that table tennis is the way ahead for Murray rather than volleyball, as he too is a gifted all-rounder. Oh – and better mention that in this week’s matches, our last surviving team in the Handicap Cup went out when New Kids lost agonisingly by 10 sets to 9 against Mylnefield’s Princes, whose allocated starting advantage proved too much for Ian Smith, Ken Falconer and Kong Wan to peg back. The New Kids were initially optimistic for a better result when they learned that one of the Princes had fallen down the stairs and was unable to play (but, thankfully, not too damaged). Be that as it may, the hopes of the St Andrews players were disappointed by the consistency of their two uninjured opponents. After the match, Ian lamented, “Losing to an 11 year old boy was not my most glorious moment in table tennis”. In Division One, Prefects went down 10–0 to the very strong Knights side. Full marks go to Ian Brumwell though, for stepping up two divisions to take Peter Bladen’s place in this fixture and, with regulars Howard Lee and Robert Brown, taking their lesson in modern attacking table tennis in good spirit. 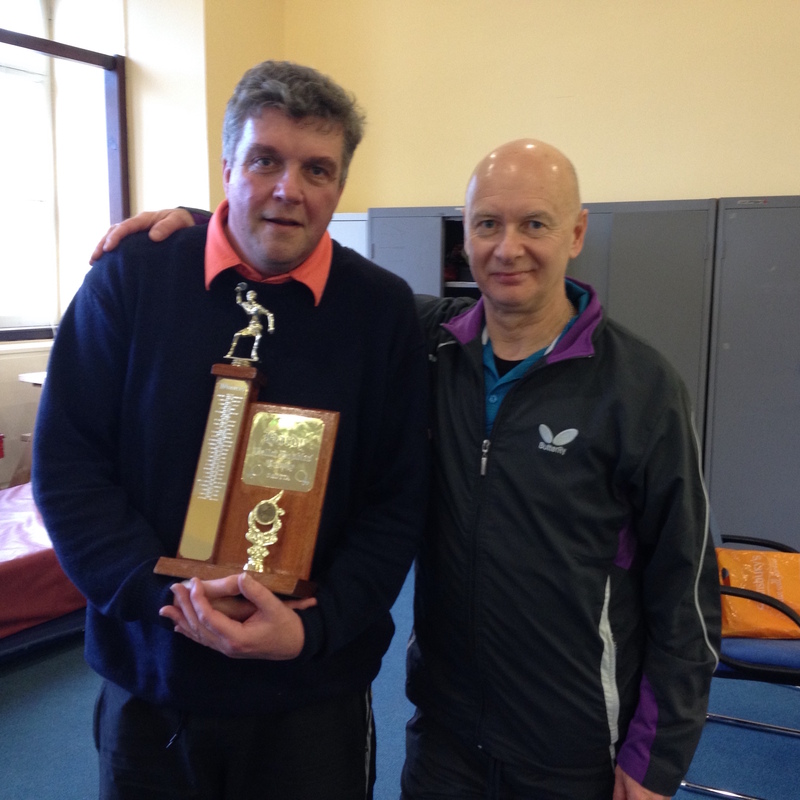 This entry was posted in St Andrews Table Tennis Club on February 12, 2016 by standrewstt. The current 2015/16 season marks a milestone in the history of St Andrews Table Tennis Club. It is the 50th anniversary of the formation of the club in the fairly informal and little recognised sporting venue which was the Art Room in the Old Burgh School. Tim Grove and Arthur Edwards passed any waking moments not taken up teaching languages and art to the youth of St Andrews by playing as many sports as possible, and decided that lunchtimes were best spent wielding table tennis bats. 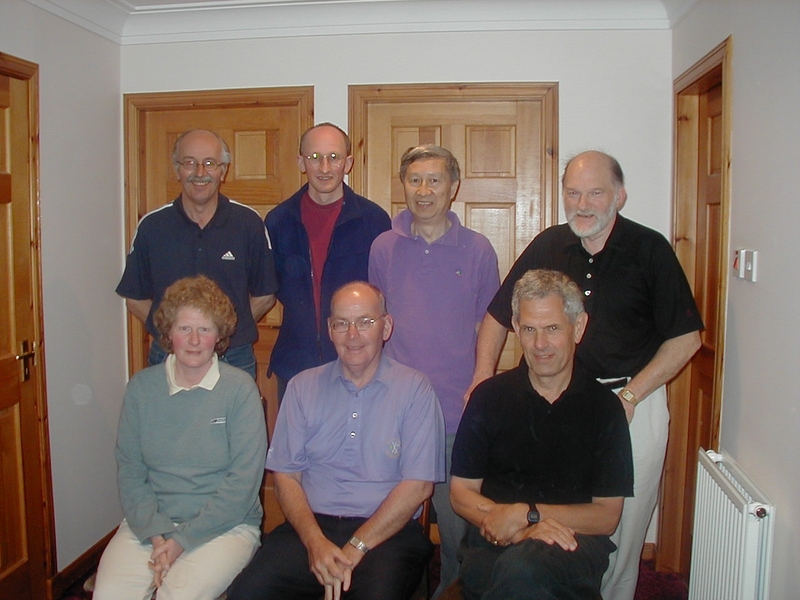 Our photo this week is of the club committee in the early Noughties, and features founder member Tim seated on the right. The story of the club’s development is available for all to read on this website under the History tab, and any past members are invited to contact the club with their memories through the website’s contact page. Also pictured is Kong Wan (standing 2nd from right) who is now the longest serving playing member of the club, having represented our teams in the Dundee League since season 1982/83. On Kong’s left is the late Graham Neilson who was also a club stalwart for decades, both on the table and in administration. Graham was responsible for drawing up the club’s constitution when it became necessary for us to have a more formal footing. While enjoying looking back over the past, the current batch of players who make up our four teams must also keep their eye on this season’s ball and this week saw success for the two teams who were in action. In Division One, Prefects had a very handy 8-2 win over Gauldry rivals, Defibrillators, as this ensures the St Andrews team is a comfortable 17 points clear of the relegation zone. Peter Bladen again amazed in winning his three singles when only picking up his bat for the second time since mid December. Howard Lee chipped in with two wins, and the two regulars had reason to be grateful to third man, late substitute Clyde Johnston, who also provided three valuable points. In Division Three, Prospects visited bottom team Princes and came away from Ward Road with 9 points in the bag to cement their mid table position. Dave Goddard didn’t drop a game all evening, Ian Brumwell also enjoyed three singles wins and teamed up with Emily Howat for a four set victory in the doubles. Emily also added two singles wins – a sign of her weekly improvement with regular league play. This entry was posted in Match reports, St Andrews Table Tennis Club on February 6, 2016 by standrewstt. Postponements meant that neither Prefects nor Swots featured in league matches, but best news of the week was that New Kids gained five points in their fight to avoid relegation. They were assisted in their task by the no show of one of the Chieftains players at Ward Road but all donations are very welcome at this critical time! Clyde Johnson again proved his class by adding two wins against Fiona Kinloch and Jim Tawse but Ian Smith was narrowly pipped in a very close four-setter with Fiona. Kong Wan also lost out in four to Fiona but Jim proved too sharp for both Ian and Kong and he combined well with Fiona in the doubles to give Chieftains a very creditable draw in the circumstances. Prospects welcomed Lairds to the Victory Memorial Hall at the start of the week but agonisingly lost out in the first four match ups. Greatest pain was for Dave Goddard who lost twice by a two point margin in the fifth set. Fabio Sani was first to put a score on the sheet for the home team with victory over Winnie Stein. Dave then teamed up with Emily Howat to score a famous doubles victory against Stewart Mason and Eddie Dougan, and followed this up with a singles win against Winnie to bring Prospects back into the match at 3-5. The comeback was not to be when Emily lost in four to Stewart and Fabio finished the night sharing Dave’s earlier torture losing out to Eddie 13-15 in the fifth and deciding game. No doubt the debriefing in the Whey Pat hostelry lamented what might have been! This entry was posted in Match reports, St Andrews Table Tennis Club on February 1, 2016 by standrewstt.